Use TB2QA85 to reference this item. About this item: This coin has been released as part of the Bike Awareness Project. It is a project initiated by USA geocacher Rockin Roddy in response to the death of his dear friend and caching companion Tod Phillips who was cut off by a left turning vehicle too much in a hurry to notice oncoming traffic. Tod was the 3rd member of Team Rod & Tod w/KAboom. Tod died on August 12 2008. Many car-drivers ask themselves this question AFTER an accident involving a motorcycle; WHY DIDN'T I SEE THAT MOTORCYCLE? The biggest thing is that motorcycles are much smaller and harder to see than cars. This is the leading cause of auto vs. motorcycle accidents. So car-drivers need to be more aware of the fact that motorcycles ARE harder to see. Lets take up our responsibilty and make sure that we are more aware of our surroundings and especially that we are more aware of the many motorcycles around us on the road. 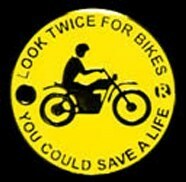 Remember: Look Twice, You could Save a Life! a nice biker for which we car drivers will be gentle. Deze coin bevindt zich nu in een cache op enkele honderden meters van onze thuiscoödinaten.